Discover "In Bloom", the new collection of wedding dresses from Pronovias 2019. More sensuality and the latest trends for your big day. 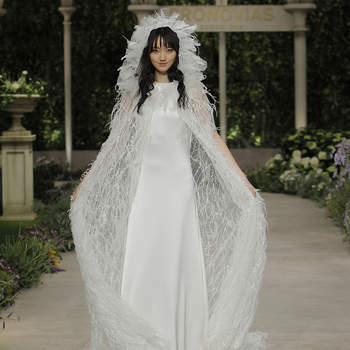 If there’s a fashion show that brings together the most well-known celebrities, influencers and brides from around the world, it is without doubt the Pronovias catwalk. As their models showcased the latest designs, the whole world watched from the sidelines. 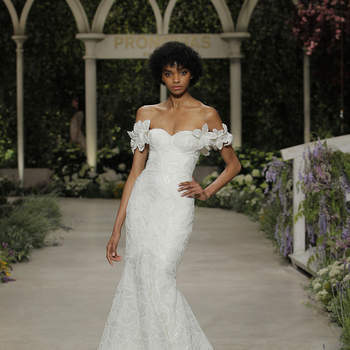 For those who didn’t get a seat at the prestigious show, however, we have created a gallery of all the beautiful Pronovias Wedding Dresses 2019. Take note of the trends, as their new Atelier collection has disappointed no-one, and is set to be huge for brides all around the world! The beautiful designs were showcased in one of the most spectacular stages. In the Pavilion of Italy in Montjüic, the models walked through the gardens and around the temple, a backdrop that was just breathtaking. The new collection, created by the creative director of the firm, Hervé Moreau, is composed of a number designs ideal for all types of weddings, from religious weddings to weddings on the beach. Something that characterises the designs is sensuality. A theme we can see in the transparent garments, adorned with lace, and with leg slits that reveal the female figure. What’s-more, two-pieces, composed of crop tops and voluminous skirts with details such as feathers, fringes and flowers bring a sense of sophistication to the collection. 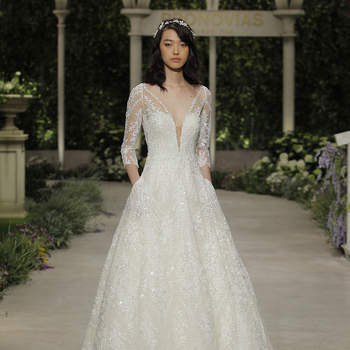 Short wedding dresses were also loved by the crowd, and the veil seemed to be less popular this year, as sheer layers gave the models a sense of grandeur. In the hand-made collection, Bloom, they used gorgeous fabrics such as crepe and silk tulle, as well as guipure, embroidered tulle and ivory. A highlight of the collection is the silhouettes: reinvented straight-cut wedding dresses as well as A-line. In short, a haute couture collection full of magic in movement that has left everyone feeling impressed. 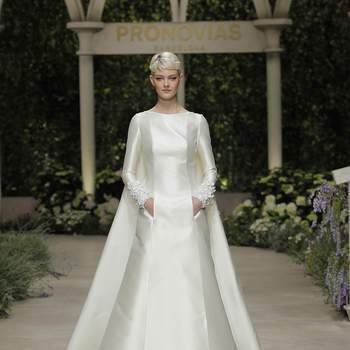 Discover the new Pronovias 2019 wedding dresses and fall in love at first sight. After your wedding is over, a lot of brides can't decide what to do with their wedding dress. Here Zankyou gives you 5 fun, alternative options to just leaving it in your wardrobe! The time has come to start your wedding dress search, the moment you have always dreamed of. 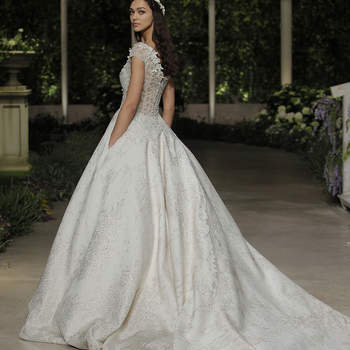 However, if you don't know where to start, here are 5 tips to make sure that you find the most perfect gown to suit your every desire. Coco Fennell's alternative dresses are sheer perfection for guests for the coming season. Flirty, fun and totally original, you'll wow in one of these incredible looks. Take a closer look and learn more about this up-and-coming British clothing designer now! Johanna Ortiz's first ever bridal collection is here - and it's an absolute knockout. Check out the gallery now, and be enchanted by the beauty of her gowns. We're sure that at least one of these incredible designs will catch your awe-inspired eyes as the dress of your dreams. The Ines Di Santo Spring 2019 Collection is certainly not one to miss. Jenny Yoo aims for elegance with her 2018 Bridesmaids Collection, and hits the mark without any trouble - check out the gallery for inspiration on what looks are in for wedding guests this season.